Gone, but...yeah, pretty much forgotten. Not sure which would be funnier. Maybe you could combine the two, then have a sign saying that you couldn't decide between the two, so you just went with both. I think the sign might end up being construed as lazy. My other option, which I failed to list was either Heaven full of devils or Hell full of angels. I think I might go with Heaven full of Devils. The levels will still be connected via Vanilla means. No fancy LunaLua. Saving will also be vanilla. Events will also be triggered through use of axes and collectable leeks, so, no LunaLua involved. The events themselves might be LunaLua. I'll be working on the vanilla side of the project and will work LunaLua in afterwards. Now, there's going to be a few delays. Firstly, I want to wait to see how LunaLua deveops, so that's going to put in a delay on the final product. Secondly, I don't want to suffer burn out so I'm taking a small break from level designing. Got to also remember to actually play some games to get inspiration. Oh gosh. Looks like upgrading to Windows 10 broke something, because I'm getting LunaLua Pointer errors when I open up my levels in the SMBX Editor. Going to have to reinstall the A2XT kit from scratch just to be on the safe side. Also, I'm debating about whether I should make this a group project because I'm running out of ideas. Mind you, the amount of coordination involved would be insane, not to mention I'd really prefer it if I kept creational control over this product. ztarwuff wrote: I'm debating about whether I should make this a group project because I'm running out of ideas. 1)In your new section, select one of the boundary options under Level Settings (Right usually works), then hold the left mouse button, shift, and the arrow-key-that-points-in-the-same-direction-as-the-boundary-you-selected for about five seconds. 2) Select a block from whatever tile-set you're using (the center one works best, if there is one), then hold shift and the arrow key that points in the other direction while moving the mouse cursor up and down the screen, rapidly clicking so that blocks are only placed occasionally rather than being one long sine curve. 3)Once you've made it back to the beginning of the section, go back and look at your new block placements, compare them with whatever enemy AIs you plan on using, and think to yourself what can I do with this? It shouldn't take too long for you to come up with ideas now that you have some block placements to work with. Now you just have to polish the block placements so they look intentional, add your enemies, and test the level, changing anything that's a bit too easy or too hard. That might seem crazy, but that's pretty much how I made Little Ruins, and the lowest score that got was a 58/90, which I think is pretty good. I've inevitably had to decide to give up the major premise of only using Vanilla SMBX to save progress. Primarily, the reason is because of deaths. I need LunaLua to force player spawn locations. Once I've figured that out, it's good to go. That comes later, though. I've also finally come up with a concept to replace Stage 4. None of this light-darkness stuff. It's been done to death. No, I'm going to be using an idea that I'll be showcasing in the latest A2XT episode. (Also homing goopas make fantastic searchlights). ztarwuff wrote: Primarily, the reason is because of deaths. I need LunaLua to force player spawn locations. You could do what Mario Prime did and have various "save points" that warp the player to a specific point on the world map. 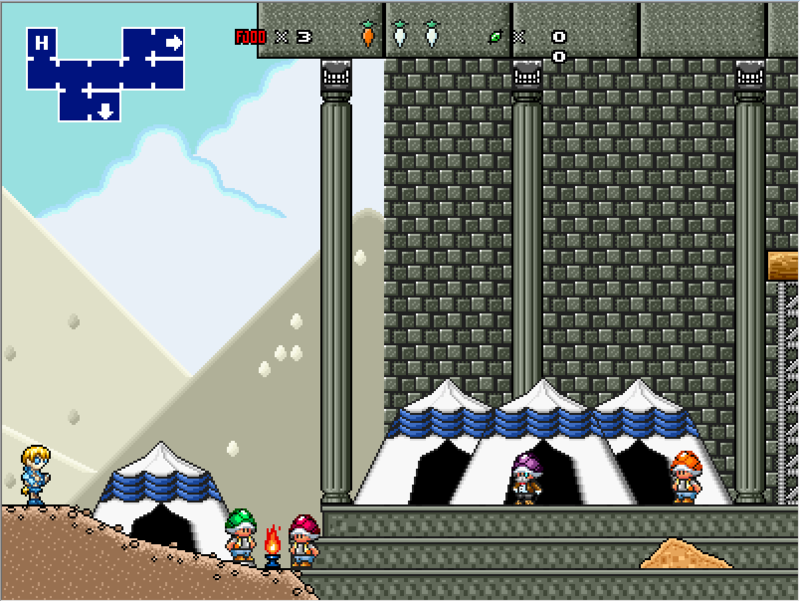 The player can save there, then enter the "level" to go back to where the "save point" is. Whoops! I just realised I came up with a vanilla idea a few posts back. Well, I'll decide on which one to go with after I've finished the main meat of the game. I'm not sure where exactly you're at at this point in time, but I'm certainly interested to see where this is headed! anonymousbl00dlust wrote: All the obstacles in my level can be beaten on the players first attempt without any 'future predicting'. swirlybomb wrote: I'm not sure where exactly you're at at this point in time, but I'm certainly interested to see where this is headed! At the moment? Boss battles are missing from all stages, but Stages 1, 2 and 3 are complete and all the various links between them are complete. I've got some neat interlevel interactions going on powered by carefully positioned collectable leeks. In fact, I've got a playable demo right here. There's actually a filler boss in Stage 1, but I'm not too happy with it, so the boss you fight against in the demo will not be there in the final product. Stages 4 and 5 are included in the demo and are accessible, but they're not playable. Update Time: I'm running into huge problems with collected leeks respawning, so I'm forced to use LunaLua to save progress. It kinda means I have to redo the flow of some levels. Also, to save time, I'm cutting the number of levels. If that's happening with SMW leeks, make sure their layers aren't hidden and you'll be alright (e.g. instead of having its layer shown after beating a boss or whatever, have it stuck in a wall, and when the event is triggered, have the wall disappear). Remember that SMB3 leeks will always respawn; it's in their nature. I could have sworn the problem was occurring when they weren't on layers, but I guess I should have another go at it. I've been making some good headway into this project of mine. At the moment, the Heaven/Hell idea from a few posts back is getting a bit on the weird side, so I'm also investigating a LunaLua code that reduces lives to zero so that when a player dies, the player always has to restart from the title screen. Player respawn problem solved! Or so I hope. If that gets a bit too frustrating, I'll look back into the Heaven/Hell idea. I'd also thought I'd display a few more screenshots. This one here's the Sand Temple again. See those holes in the floor to the left of the life counter? Spikes rise out of those. I'm currently using the SMB3 Piranha plant sprites, but the problem with those is that they can be killed. Above is a screenshot from the Water Tower. There's a horizontal wrap-around all the screens in the level so in this particular shot, to get to the platform above, the player has to keep jumping left. And here's the new Stage 4, the Chamber of Revolution. 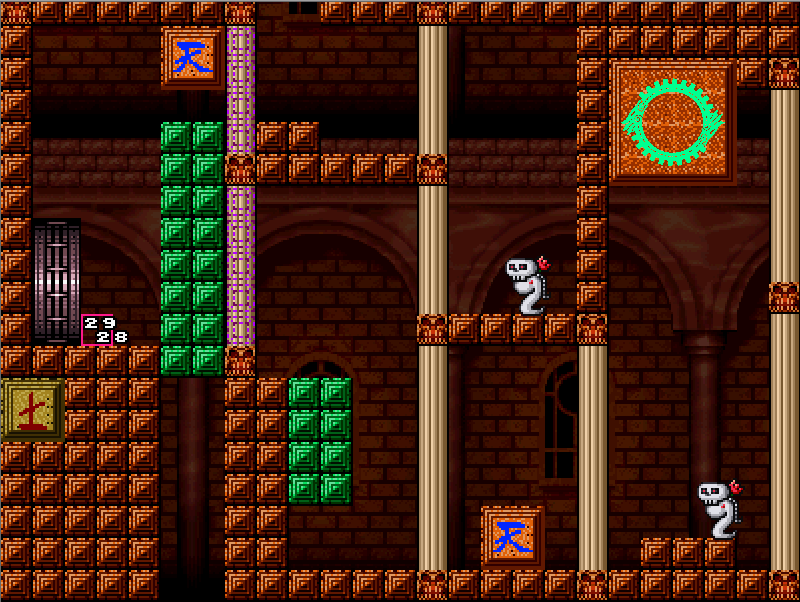 I'm reusing a gimmick from an A2XT Episode 2 level I made but am applying it on a huge scale. That's 20 plus screens that have to be meticulously crafted to ensure the player can never get stuck. See the goobat hanging in mid-air? In the final version, it'll be hanging from a pole. I'm also going to be using LunaLua to create Switch Palace technology. I'll also be using the raocoin lunalua technology too, hence the raocoin in shot. The idea is to have the player unlock the fireball/flight/ice etc abilities with collected raocoins. I tried not having this, but some of the quests were ridiculously evil in vanilla SMBX form. There's one where a player has to grab a powerup from one stage and cross three stages to get to a fourth without once getting hit. I realised that was a bit harsh so hopefully LunaLua will save the day. Anyway, Stage 4 is taking a huge amount of time, so big delay there. iirc LunaLua has onHarm and onKill events you can use to cancel any damage to those piranha plants. Rockythechao wrote: iirc LunaLua has onHarm and onKill events you can use to cancel any damage to those piranha plants. The LunaLua wiki doesn't mention those events. How do I use them? My bad, it's onNPCKill and probably onNPCHarm... the latter doesn't seem to be on the page, though I recall it being discussed in the SMBX 2.0 dev channel. Just got informed that I was mistaken and onNPCHarm isn't a thing. It kind of works. Was I supposed to copy it wholesale? Whenever something kills the NPC, it doesn't die, but it moves to the left/right forever. I also tried altering the killreason with a number as stated in the wiki, but that seemed to just break the code. Ah, hm. You should be able to fix that by clamping them to their spawn positions. Rockythechao wrote: Ah, hm. You should be able to fix that by clamping them to their spawn positions. Unfortunately that didn't seem to do anything. I'm resorting to using blocks and layers instead, because I just realised I needed the spikes to come up regardless of a player's proximity to the hole which the npc just doesn't do. Hey just wondering what's been happening with this, since it was a neat concept. ano0maly wrote: ↑ Hey just wondering what's been happening with this, since it was a neat concept. It's been on hiatus for a very long time. For some reason, I can't open up my files in the old SMBX, so I migrated everything to SMBX2.0. None of my custom files seem to load in the SMBX editor bundled with SMBX2.0, and the PGE editor is still in alpha stage, so I have to load it up as if I was playing a new game. SMBX2.0 doesn't seem to be at the stage to allow me to properly develop a game at the moment, so I thought I'd wait for a more advanced SMBX2.0 to be released. 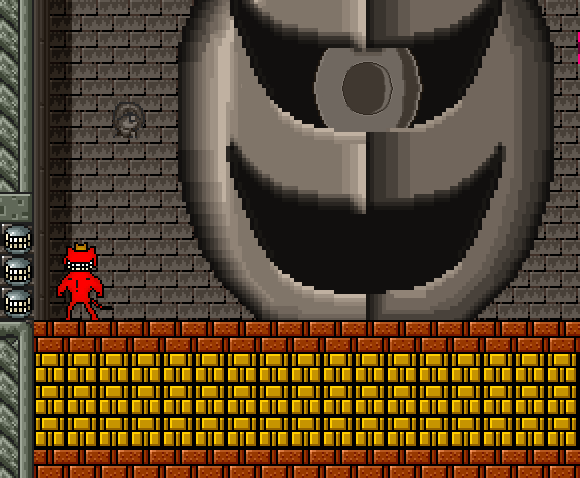 I'm also very tempted to cut down on the levels in order to make the project easier to complete. Re: El Gurdyioza: Good News! I managed to fix my copy of the original SMBX editor not too long after my last post, and I've made some serious headway. I've been doing some minor tweaks of the completed stages, and have nearly completed Stages 4: Chamber of Revolution and Stage 5: [INFORMATION REDACTED]. This one has been a nightmare to work on. The main level is a 24-screen section with an upside-down version in another section. Once you obtain a specific leek in the level, it unlocks doors that allow you to swap between the rightway-up and the upside-down. It's basically Stone Tower Temple, the level. 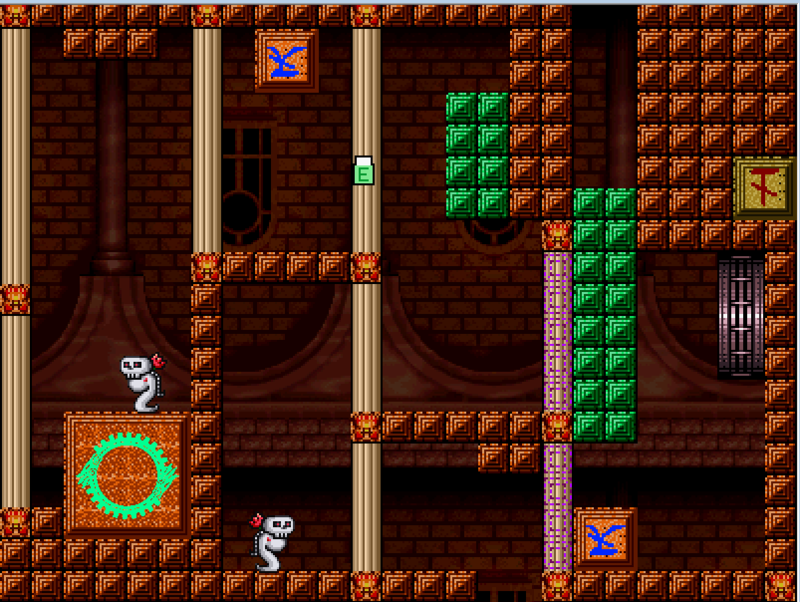 The green blocks are re-sprited pipes that fall into place as you "rotate" the level. Stage 6: Tomb of the Unknown Hero. Yeah, it's an ice stage. Only the ice is slippery. The snow, not so much. I'm tempted to put some mild quicksand physics on the snow to simulate the impeded movement that usually comes with it. Also, hidden in each of the levels, except Chamber of Revolution, is one secret entrance to the final level. Chamber of Revolution holds the main entrance. 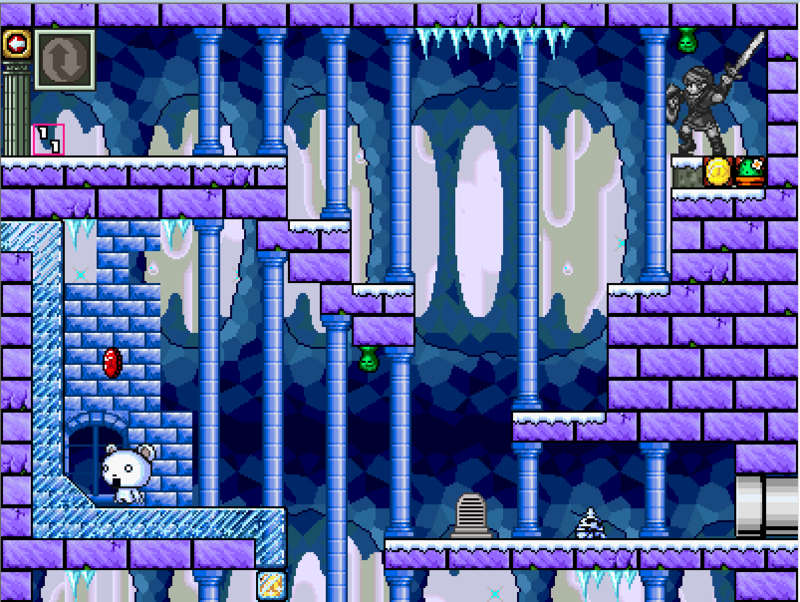 The idea is that each secret entrance, only accessible after beating a level's boss, leads to a leek that slowly unlocks access to the last part of the final level. It's a completely vanilla SMBX boss, but I'm quite proud of the simplicity of its concept. It's SMB3 Bowser, but only the top and bottom layer of bricks can be broken by him. The ones in the middle can only be broken by Sheath. I initially had alternating layers of blocks, but it made the fight way too long. Sheath is very susceptible to being caught underneath SMB3 Bowser, so anything that dragged the fight out made it too unfun. Oh, and one more thing. I need a bit of help. What should I call these guys? They're basically Toads with Koopa shells in place of mushroom caps. Now that raocow is playing La Mulana, to which this project is kind of inspired by, I thought I'd give a progress update. Yes, there's a section of the game that's inspired by THAT level in La Mulana. Hopefully, though I've left enough visual cues to stop it from being too frustrating. Also, I've created a map system. I've currently got the map set to the select button, but need to get the game to pause and display system information such as the music that's currently playing, the number of collected red coins. Lookin' good. Are you making the map screen in Lua or? ztarwuff wrote: Oh, and one more thing. I need a bit of help. What should I call these guys?